On the first page of my planner, right under a clear page protector, I've created a checklist of sorts that hits all the most important aspects of day-to-day living. Your life might need different important things on your day-to-day set-up. Perhaps you are a single, neat apartment dweller whose housecleaning consists of a picking up after yourself and a quick wipe down of whichever room you are in occasionally. But your weekday job might require you to enter a timesheet daily or clear off your desk at the end of the day. Maybe you don't struggle with depression. Instead, you are tracking blood pressure or weight and need a place to do that every day. The key to a great first page of your planner is to think about things that are important to address on a daily basis and set-up the very first page of your planner to reflect those day-to-day demands on your attention. For me, that means I focus on my health, my house staying clean and organized, and my blog. Consider your top three or four priorities and make a list of those goals. Since these are the things you plan to work toward achieving every day, they merit the first page of your planner. Once you've decided on what you plan to work on every day, start to determine the steps that truly need to happen daily and any things that just have to happen often or routinely, but are still critical enough to list. In my case, for example, taking medicine daily is one of my steps in reaching my health goals. I'm so routine about taking my nighttime meds, but I am horrible about taking my morning meds. So taking morning meds go on the first page of my planner. Let me show you again the image of my personal first page. 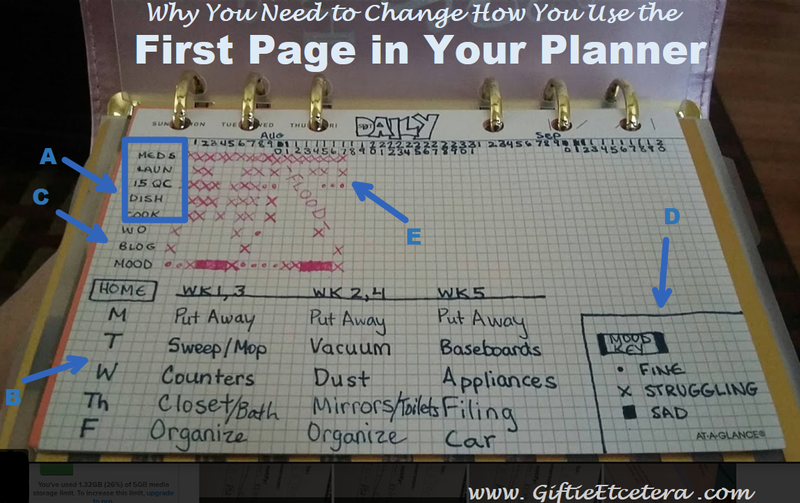 I don't know a better way to teach you how to organize this other than to show you an example of the final product - my own first page - and explain why I set it up like I did. First, I schedule those minimum tasks that make the world continue smoothly for me. Meds go first, followed by quick housekeeping tasks. I have a schedule for each week of tasks that I aim to perform. I used to keep the schedule elsewhere, but I never looked at it. Can we say speed-cleaning whenever a friend popped by to visit? So I put it right here in my face. Sometimes, that 15 minutes is better spent in a more important place. If so, instead of an X, I put a dot. That way, I have some sense of how often I am cleaning for real. Self-care is so important. 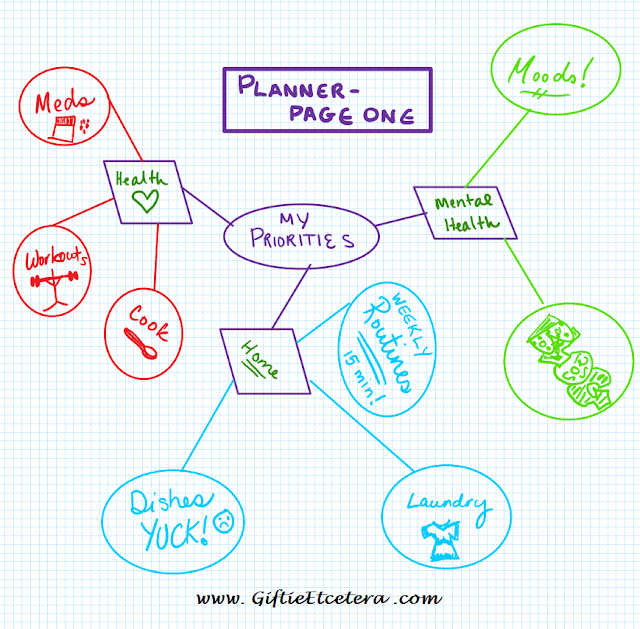 I track the things that help me cope, like working out or blogging, on the chart. I like to examine if self-care is slacking and causing bad moods. I had a complicated system for tracking moods, but a filled-in square, an X, and a dot make it visually easy to track. As I've said above, except for mood (which gets a , X, or dot), I used an X for done and a dot for sort of done. Sort of done might mean that I took my meds, but late, or I did housework, but not what was on the list. Your first page, of course, does not need to look like mine. Each person will have a different list that evolves with use and lessons learned. I figure mine is in a pretty good place right now, though, since it got me through Louisiana's crisis without losing my sanity. Having a planner really helps in the stressful times or crisis times. I'm glad that you are able to keep yourself going and healthy in the midst of it all. When people ask about preparing for a crisis (or just a stressful, busy time), I always encourage good habits. If you already have them in place, it is so much easier to continue. If you are healthy, you are going to deal with things better. I found that I never look at the front page of my planner. I've been doing some interesting reading on habits, how the brain works, how different people are differently motivated, etc, and I think that type of tracking doesn't work for my brain. What is currently working is having alarms reminders on my phone. I also think through my day in the morning and make sure I have key things on the planner for the day. Even though I'm using a pocket sized planner, I'm going to try this. (thinking I may not have enough room on a page) I do keep a list of daily/weekly/monthly routine tasks written on my page marker and also enter on my daily page, but think that may be overkill. Glad your planner is holding up and keeping you together during this time. I hope all is well with you and yours. It's going to be a long road for everyone there, but we continue to pray for these people that they're given strength and hope.